Lawyers often talk about “bright-line rules.” Example: If you are at least 21 years old, you can legally buy liquor in the U.S. If you will turn 21 when the clock strikes midnight tonight, you cannot. Never mind that certain 20-year-olds would be able to drink more responsibly than certain older people — there’s a bright-line rule. Bright-line rules provide the comfort of easy decision-making. But many times there is no bright line, leaving people of good will to agonize about the lesser evil, often under intense pressure. When does a ticking-time-bomb interrogation cross the line from harsh to torturous? When does giving morphine to a dying patient cross the line from providing comfort to homicide? The first question, of course, has been hotly debated for the past few years, with new information emerging this week. The second is cast in stark relief by an extraordinary 13,000-word cover story in the New York Times Magazine, about allegations of euthanasia in the wake of Hurricane Katrina. These scenes provide previously unpublicized details about the transformation of the man known to U.S. officials as KSM from an avowed and truculent enemy of the United States into what the CIA called its “preeminent source” on al-Qaeda. This reversal occurred after Mohammed was subjected to simulated drowning and prolonged sleep deprivation, among other harsh interrogation techniques. “KSM, an accomplished resistor, provided only a few intelligence reports prior to the use of the waterboard, and analysis of that information revealed that much of it was outdated, inaccurate or incomplete,” according to newly unclassified portions of a 2004 report by the CIA’s then-inspector general released Monday by the Justice Department. The debate over the effectiveness of subjecting detainees to psychological and physical pressure is in some ways irresolvable, because it is impossible to know whether less coercive methods would have achieved the same result. But for defenders of waterboarding, the evidence is clear: Mohammed cooperated, and to an extraordinary extent, only when his spirit was broken in the month after his capture March 1, 2003, as the inspector general’s report and other documents released this week indicate. This was as close to a ticking-time-bomb scenario as you are likely to get in the real world: The mastermind of 9/11 was replying “soon you will know” in response to questions about additional terror attacks. It seems clear that specific terrorists were apprehended and actual American lives were saved based on the information KSM oh-so-reluctantly provided. The argument is over whether that justifies torturing him. It’s hard to feel sympathy for KSM, but I’m troubled by the fact that techniques that arguably are torture seem to have been used on numerous prisoners. However, at least in the case of KSM, waterboarding was authorized and conducted in the belief, supported by legal counsel, that it fell short of torture. We as a society seem to be deciding that waterboarding should not be permissible — but the desire by some on the Left to prosecute Bush Administration officials relies too much on the benefit of hindsight. I’m struck by the parallels between this debate and the dying-patient issue, after reading Sheri Fink’s NYT Magazine cover story, the product of two and a half years of research. After the Katrina floodwaters receded and 45 patients were found dead at Memorial Medical Center, an investigation was launched, focusing on patients who received morphine injections. Morphine, a powerful narcotic, is frequently used to control severe pain or discomfort. But the drug can also slow breathing, and suddenly introducing much higher doses can lead to death. In fact, the distinction between murder and medical care often comes down to the intent of the person administering the drug. Cook walked this line often as a pulmonologist, he told me, and he prided himself as the go-to man for difficult end-of-life situations. When a very sick patient or the patient’s family made the decision to disconnect a ventilator, for example, Cook would prescribe morphine to make sure the patient wasn’t gasping for breath as the machine was withdrawn. The article does a masterful job of taking the reader through the thought processes and decisions involved in triaging patients as the floodwaters rose, knowing some of them will die either because of the conditions or from the stress of evacuation. Faced with an evacuation order and a shortage of helicopters, medical personnel had to decide whether to leave dying patients alive but unattended, or to hasten the inevitable with a large dose of morphine. Although a grandstanding attorney general called some of the deaths “simple homicide” and staged SWAT-team arrests, a grand jury ultimately refused to issue any indictments against medical personnel at the hospital. I think declining to indict was the right call in New Orleans — and I think it would be the right call regarding the Bush Administration’s use of harsh interrogation techniques, or torture if you prefer. People in unique situations and under incredible life-and-death pressure have to have some latitude in choosing the lesser evil. These scenes provide previously unpublicized details about the transformation of the man known to U.S. officials as KSM from an avowed and truculent enemy of the United States into what the CIA called its “preeminent source” on al-Qaeda. 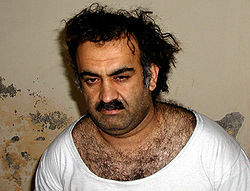 This reversal occurred after Mohammed was subjected to simulated drowning and prolonged sleep deprivation, among other harsh interrogation techniques. This entry was posted in Uncategorized and tagged Evil, Islamic Fascism, KSM, Torture, Web Goddess by Kirk Petersen. Bookmark the permalink.